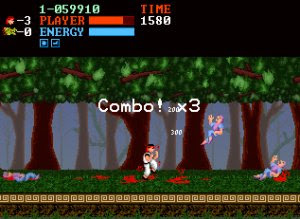 Kung Fu 2 was originally created for the 2008 Retro Remakes Competition. When it was submitted, the game was not 100% complete. There were only 6 levels finished. Nevertheless, it won first place in its category (games without sequels). Kung Fu 2 is a sequel to the NES version of Kung Fu. Kung Fu was originally created by Irem Corporation in 1984. Kung Fu 2's goal was to take the NES version, and make a sequel with revamped graphics, refined game-play, new areas to fight in, and new twists in the plot. Finally, Kung Fu 2 is finished and can be enjoyed by anyone!